Storage: Leeks will keep well in the refrigerator for a week or more. Wrap them loosely in plastic wrap to prevent their aroma from being absorbed by other foods and to help retain moisture. 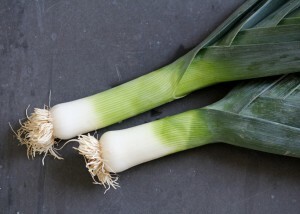 Cooked leeks should be refrigerated in a sealed plastic bag or covered container and used with one or two days. Do not freeze leeks. Preparation: Leeks should be cleaned thoroughly because soil can collect between the leaves and work its way down the stem. To prepare leeks for any recipe, first cut off the roots at the base and the dark top portions of the leaves (the leaves are edible but have a stronger, less pleasant flavor than the white stalk). Then slice the stalk as directed. Nutritional Benefits: Raw leeks are a source of fiber, vitamin B6 (for metabolic function), vitamins A (for eye and skin health), C (for immunity) and folate (for heart health).